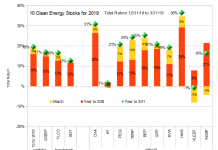 After a stormy winter for the broad market and clean energy stocks, including my picks, March and April brought relative calm. Better yet, my model portfolio has rebounded from its February lows, although its benchmarks (SDY for the broad market of income stocks and YLCO for clean energy income stocks) have mostly been treading water. The gains were led by two of my less conventional clean energy picks, Seaspan (SSW) and InfraREIT (HIFR). Seaspan owns (mostly very efficient) container-ships, which most people would not associate with clean energy, but which I include because they they are much less energy intensive compared to moving a similar amount goods by any other means. InfraREIT is an owner electric transmission lines which, although not limited to carrying clean energy, are essential to the addition and integration of large amounts of wind and solar onto the grid. 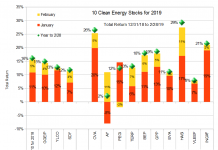 Along with wood pellet MLP Enviva Partners (EVA), three of my five least conventional clean energy picks are up for the first four months of the year. 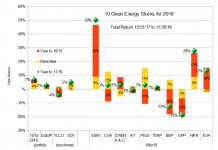 All of the the five more traditional Yieldcos mostly invest in wind and solar are showing losses. For me, the lesson here is the value of diversification and looking at stocks others might not be considering. The importance of such diversification only increases when investing in an otherwise very narrow sector such as clean energy. My short term stock picking was less successful over the last two months. 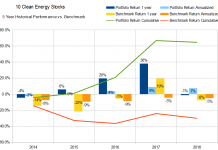 In the March update, I highlighted Covanta (CVA, up 1.2% in March and April), NRG Yield (NYLD/A, up 14.5%), Pattern (PEGI, down 0.3%) and Brookfield Renewable (BEP, down 1.5%) as attractive short term buys. On average, these four picks were up only 3.5%, or less than the average return on all 10 picks. 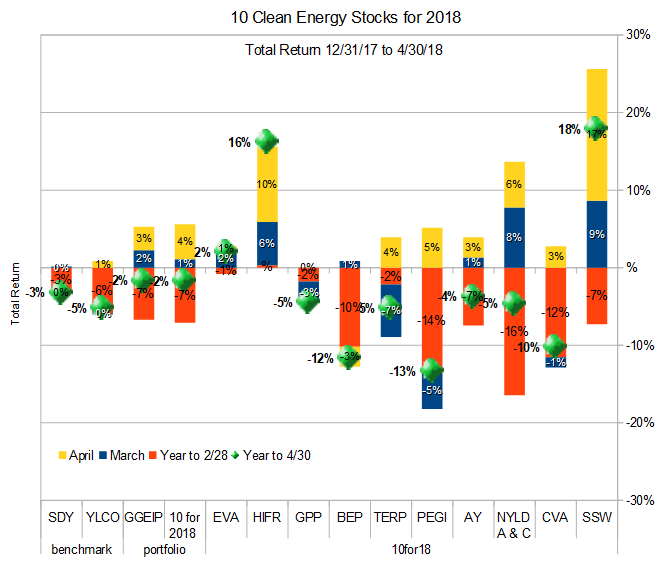 Ten Clean Energy Stocks for 2018 model portfolio and benchmark total return, through April. Leading independent charter owner of container ships Seaspan’s stock advanced steadily after hitting a low of $5.50 on March 13th as investors started to recognize the strengthening fundamentals of the shipping industry (something that Seaspan management has been commenting on for almost a year now.) Deutsche Bank raised its target price for SSW from $7 to $13 and bumped its rating to “Buy” based on a strong forcast for free cash flow. On May 2nd, Seaspan reported first quarter results. The strengthening fundamentals were clear in much stronger vessel utilization, which rose from 92% in the first quarter of 2017 to 97% this year, with a slightly larger fleet, leading to higher revenue and improved margins, causing the stock to continue its climb. The stock of US leader in the construction and operation of waste-to-energy plants Covanta mostly treaded water for March and April. The company reported first quarter results on April 26th. Overall, I felt the results were encouraging, with the company’s Fairfax facility operating well after a long outage for repairs and upgrades in 2017, and progress continuing on new investments. After an initial positive reaction on the 27th, the stock puzzled me with a sharp sell off. As I write on May 4th, it seems to have mostly recovered. 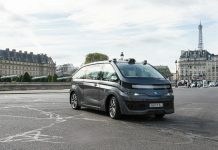 Although I remain puzzled by the sharp sell-off and rebound after the most recent earnings, I expect the stock to do well for the rest of the year if the company can just continue to operate its existing plants smoothly while slowly advancing its investment plans, most notably its UK partnership with Green Investment Group. The purchase of NRG Energy’s (NRG), sponsorship stake in NRG Yield by private infrastructure fund Global Infrastructure Partners (GIP) remains on track and is expected to close in the second half of 2018. The upcoming change in sponsors has not put growth on hold at NRG Yield: The Yieldco closed the acquisition of a solar farm from NRG Energy. The smooth transition is likely in part due to the fact that GIP is also buying NRG’s renewable development arm. NRG Yield announced first quarter results on May 3rd. Overall, first quarter results seemed unsurprising, but the market reacted favorably, most likely because they included the announcement that the Yieldco had refinanced it’s $495 million revolving credit facility, extending the maturity for 5 years and lowering the interest rate by 0.75%. It also boosted its quarterly dividend to $0.309 per share, a 3.7% increase over the prior quarter and in-line with its 15% annual dividend growth target for 2018. I found NRG Yield’s recent small purchase of a small (2.8MW) fuel cell power plant in California from FuelCell Energy (FCEL) interesting in that it is the first purchase of fuel cells by a Yieldco. NRG Yield has always been one of the more diverse Yieldcos in terms of its assets, and that diversity is valuable in its ability to insulate the Yieldco from weather-induced revenue and earnings fluctuations. For example, in the first quarter, NYLD’s strong solar results offset lower wind production. Atlantica Yield announced its fourth quarter 2017 earnings on March 7th, shortly after my last update. The company reported steady results, and after a year of paying relatively low dividends compared to its cash available for distribution (CAFD), a strong balance sheet with falling debt. The company is targeting an 80% pay-out ration on expected CAFD of $170-$190 million. This equates to a average quarterly dividend of $0.34 to $0.38, so we can expect continued dividend increases of at least 2 cents a quarter the rest of the year. On April 24th, Atlantica’s new sponsor, Algonquin Power & Utilities (AQN) announced that it would exercise its option to buy an additional 16.5% stake in AY at $20.90 per share, increasing its stake to 41.5%. Investors should take note of this vote of confidence and have confidence themselves. Wind Yieldco Pattern Energy Group has been in the doldrums for two reasons. First, the company is paying out 100% of its CAFD in dividends, while management says it wants to reduce this to 80% over the next few years. Second, wind conditions for the last few quarters have not been favorable at their largest wind farms, meaning that CAFD has repeatedly come in below expectations. First quarter wind production looks unlikely to blow investors away when PEGI reports earnings on May 10th. With the stock price in the doldrums, any new stock issuance would only dilute cash flow per share, so Pattern’s options for reaching its 80% payout ratio target are limited. The most obvious is a dividend cut, which management has repeatedly said they will not consider. Instead, they expect to get incremental cash flow increases from inflation adjustments and efficiency improvements at their existing wind farms. They are also continuing investment in new wind farms in Japan. These investments are currently being funded with debt, remaining cash on hand, and recycling capital by selling minority interests in their existing wind farms. Selling stakes in some wind farms to fund purchases of other wind farms can produce incremental cash flow because Pattern keeps a management fee as well as its proportional share of the production; such management fees produce incremental cash flow without new investment. Cash flow may also be improved if the incremental returns on new investments are higher than the ones sold. With asset sales going to cautious financial investors such as pension funds, and Pattern’s management team’s long and deep experience in the the wind sector, it seems likely that the Yieldco can produce incremental cash flow by recycling capital from asset sales. On other words, it seems likely that Pattern should be able to grow CAFD modestly in 2018. By holding its dividend constant at $0.422 per quarter, it should be able to bring the payout ratio down below 100% this year, even if wind conditions continue to be unfavorable. For this reason, I expect that Pattern will be able to maintain its dividend even if wind conditions continue to disappoint. Investors should not expect any meaningful dividend growth for the next 2-3 years, until the company achieves its target 80% payout ratio, but at the current price of $18.18, the current dividend amounts to a 9.3% yield. At this level, even reduced fears of a dividend cut (perhaps after a couple quarters for favorable wind conditions) should lead to price appreciation. Although I expect first quarter earnings to disappoint again next week, any further weakness in the stock price that causes should be seen as a buying opportunity. Terraform expect to achieve cost savings with by outsourcing the operations and maintenance of its wind facilities to a wind manufacturer. The company has already achieved some cost savings through refinancing its debt at more attractive interest rates. This was made possible by the confidence that its new corporate sponsor, Brookfield, gives lenders in comparison to its former bankrupt sponsor, SunEdision. One dramatic event in January was when a crack at the base of a wind turbine blade caused the spinning blade to bend and, as it was spinning, sheer off the tower the turbine was mounted on. While there were no injuries from the incident (windfarms are mostly located in uninhabited areas and managed remotely) Terraform decided to temporarily shut down all of its turbines with blades from the same manufacturer until it determined if any of the others were at risk. The incident and shutdowns cost Terraform approximately $6 million, all of which the company anticipates will be recoverable from insurance. With its price near $11, and a solid financial plan to grow the dividend at 5 to 8 percent per year, Terraform is an good long term buy. Brookfield Renewable Partners reported first quarter earnings on May 3rd, with strong generations results coming in above long term average generation, and per unit Funds From Operations (FFO, a measure of the partnership’s ability to pay distributions and similar to CAFD used by other Yieldcos) growing to $0.62 per unit compared to the $0.55 per unit from a year earlier. The growth was largely due to the acquisition of Terraform Power (TERP, see above) and Terraform Global in late 2017. Brookfield targets sustainable annual distribution and FFO per unit increases of 5% to 9% on an annual basis. In the update, management says it expects to be able to deliver growth near the high end of this range over five years, despite the rising interest rate environment without raising new debt or equity. Ethanol MLP and Yieldco Green Plains Partners will announce first quarter results on May 7th. While the partnership has some protection from the ups and downs of the ethanol market from its agreements with its sponsor, Green Plains (GPRE), the news in this sector has not been good. While ethanol has strong support from Republicans in Congress, the Trump administration’s EPA head Scott Pruitt have been using his regulatory power to grant waivers to dozens of oil refineries. These exemptions are possibly illegal because they were intended to be used only for small refineries that are facing financial hardship. They have also been given without public comment, and some of the recipients are simply too large to qualify as small refineries. One was given to the fifth-largest refiner, Andeavor (ANDV) in the nation. Such waivers were designed for refineries producing less than 75,000 barrels per day that can demonstrate that they suffer a “disproportionate economic hardship” from the costs of RFS compliance. Andeavor’s 2017 net profit was $1.5 billion. Until these issues can be sorted out in the courts, the sheer number of exemptions have reduced the required volume of ethanol to be bought by refiners by six percent, a large enough percentage to significantly affect the price dynamics in any market. It still remains to be seen if Pruitt’s gifts to oil refiners at the expense of ethanol producers will survive judicial scrutiny, or if these exemptions will harm Green Plains to the extent that its contracts with Green Plains Partners are at risk, but Pruitt’s actions have definitely increased the risks for the partnership. Electricity transmission REIT InfraREIT continues to perform well. The rise is most likely due to a rebound from December lows caused by worries surrounding the tax bill, and how it would be treated by utility regulators. In its first quarter earnings announcement on May 3rd, the company said that it intended to adapt to the new tax environment by opting to become a traditional corporation, rather than a REIT. The company plans to maintain its strategy of growing its business as a transmission-oriented utility, supporting load growth and the expansion of renewable energy in the Texas Panhandle region. Most earning metrics increased substantially in the first quarter from a year earlier, but this was driven mostly by the structure of rent payments, which have a higher proportion of fixed rent compared to variable “percentage” rent than they did in 2017. Since percentage rent was mostly paid in the third and fourth quarters, investors should be careful not to read too much into the increase. Wood pellet Yieldco and Master Limited Partnership Enviva reported first quarter results on April 29th. Results were well below expectations due to a fire at one of their wood pellet terminals costing $19.5 million in related expenses. These expenses should be recoverable from insurance in future quarters, and so the company re-affirmed its distribution guidance of $2.53 for the full year. With the just-declared $0.625 distribution for May, that means we can expect an average dividend of at least $0.6425 for the next two quarters, so the next to raises are likely to be larger than the 0.5 cent raise this quarter, most likely in line with recovering cash flow as the insurance proceeds come in. The world market for wood pellets remains strong and growing with regulatory action in Europe and Japan driving demand growth. Even the United States got in on the action this year, with the EPA ruling that biomass from managed forests should be treated as carbon neutral when used for energy production. This ruling is aligned with numerous state policies and with the European Union, but the greenhouse impact of Enviva’s wood pellets had been in a regulatory gray area previously, at least as far as the US federal government was concerned. Two months ago, I wrote that it was “time to start putting some (but not all)… cash allocation to work.” With the model portfolio up 5.3% in the subsequent two months, that seems to have been a good call, even if the four picks I highlighted at the time did not advance as far as the portfolio as a whole. After that advance, I am returning to wait and see mode, and I am selling calls to lock in some profits in InfraREIT. Despite its larger advance, I still think Seaspan has significant room to the upside, so I am not selling calls there. For longer term readers, I’ve also been taking profits in MiX Telematics (MIXT) as it hit $15, $16, and $17. MiX was a fixture in this portfolio starting in 2014, when it started the year at $12.12. I subsequently urged readers to add to their positions at $6.50, $4.22, and $6.19 in 2015, 2016, and 2017, respectively. I’m happy to say that I followed my own advice. If I were looking to add to my position in any of the stocks in this list today, my top short term picks would be BEP, CVA, and EVA. Disclosure: Long PEGI, NYLD/A, CVA, AY, SSW, TERP, BEP, EVA, HIFR, GPP, AQN, MIXT. Tom – Any thoughts on PEGI earnings yesterday. Did they disappoint? The market seemed to like them. Wind production was 7% below the long term average, so that was the “expected” disappointment, but I guess the market was cheered by the fact that the company maintained guidance and maintained the dividend. I really did not find anything surprising in earnings, except the market shooting up in response. Seems to be coming back today, so probably just sound and fury signifying nothing. Thoughts on AY’s results and their one cent dividend raise versus your expectation? Pretty much what I was expecting. They are being cautious about the dividend raises while the stock price is in the dumps so that they can fund acquisitions with retained earnings. Not sure why the market does not get this story, but I’m fine being patient.